Team building workshops & activities to accomplish your team building goals. Our corporate events inspire new teams while boosting the morale of existing ones. Our team building games build management skills, develop teamwork, and teach communication while renewing company spirit and motivation. Our teambuilding workshops create a risk free environment where people learn team bonding in a creative, non-threatening way. We ensure that participants will become fully involved in teamwork, communication and creative problem solving, while having a great time. Get motivated with team building activities! Custom designed team building workshops with our interactive team building leaders from Los Angeles, California to Las Vegas Nevada. Team building ideas that are not rope courses. We incorporate interactive team building ideas, comedy and audience participation into every team building event to to bring your company together as a unified team. Fun, morale boosting team building events that keep company spirit as a number one goal. Let Dial M create a CUSTOM team building event for your next corporate event. Did you know we have another web site devoted to our teambuilding events? Go to www.teambuilding.bz to learn more about what we can do for your company. Dial M Productions, specializing in corporate events since 1985. We design Teambuilding workshops to accomplish your goals, in an atmosphere where learning is fun! OUR GOAL... Our team building games build management skills, develop teamwork, teach team building communication and listing skills, while renewing company spirit and motivation. Our team building workshops create a risk free environment where people learn "theory through practice", discovering their potential in a creative, non threatening way. You will notice an inspired desire to try again, to get it right, motivated by teamworking games to improve their team building skills. And in the process, they'll be having an enormous amount of fun! Let The Godfather Impersonator pay his respect to your award winners. "Imagination is just as important as knowledge"
Dial M Productions designs team building workshops to accomplish your goals in an atmosphere where learning is fun! Our events are versatile enough to inspire new teams while boosting the morale of existing ones. Our team building games build management skills, develop teamwork, and teach communication and listening skills, while renewing company spirit and motivation. Our workshops create a risk free environment where people learn "theory through practice", discovering their potential in a creative, non-threatening way. We ensure that participants will become fully involved in teamwork, communication and creative problem solving, while having a great time. Will “The Donald” and his side kicks decide that your team has what it takes to climb the corporate ladder? Relive the challenges created on “The Apprentice” T.V. Show, with this inspiring, interactive team building game where you’re not fired, but hired! Your goal is to navigate your way through business objectives to gain the ultimate power position, to present your project to “the Donald” in the “boardroom”. The team with the best presentation will be chosen by your company executives at the “Next Apprentice”. • GAME SHOW " THE LONGEST CHAIN GAME SHOW"
A team building game show that will have everyone eager to answers the questions to win their team a valuable “link”. 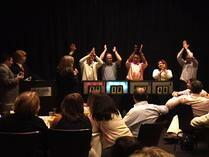 The “Longest Chain Game Show” is a fast moving game show and can be played in about 90 minutes. Our hosts are "Whose Line is it Anyway" alumni and veterans of film, television and the stage. They're brilliantly funny and deliver the game show in an atmosphere of friendly competition. Our game show hosts create an environment where the players can have a hilariously fun time whether they win or lose. Throughout the game show, our game show hosts will keep the game show fun, fast and entertaining. They will announce the player’s team names, assist in organizing the teams, and encourage the audience to root for their team. The activities during this game show will focus on clear communication, leadership, collaboration, empowerment, to make decisions quickly, improve what is being communicated, to act effectively, to take risks, and to be accepted and appreciated by your team mates. This activity will build on the desire to practice the tools that are necessary to become a productive member of any team. The team at the end of the game with the most links wins. Several different techniques and exercises will be explored in this team building workshop. Team building games involving creativity, group participation and communication. Participants work together with our highly trained teambuilding leaders in an atmosphere similar to the televisions show, "Whose line is it anyway?" You'll see teams commit to problem solving skills that they'll be able to take back to their everyday workplace. 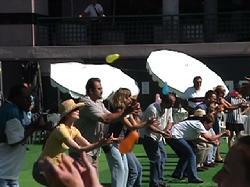 Let our "coaches" and "cheerleaders" lead and motivate your company though some fun family picnic style games. Relay races where no one runs! Instead; put on gloves, try and open a package of gum, chew it and pass the gloves on! Write your own company cheer and perform in for the group. We have a very wide variety of creative games that will make you laugh as you engage in friendly competition. • TEAM BUILDING WORKSHOP "THE CORPORATE SINGING WORKSHOP"
Write your own songs! An engaging process in which employees write their own songs in any style that will suite your group; blues, beach theme, country, pop... They can write songs with a message, such as: "what's going on in the organization" or "how to work as a team". They can also write songs with no specific goal other than bonding and presenting the material as a team. Backed by our professional musicians, employees take turns rehearsing with the band before they present their freshly penned songs to the group. Our facilitators are quite skillful at getting even the most reserved to add a line or sing a word. And, there's always enough hams out there to sing the humorous selections of your "Corporate-INXS Workshop". The event ends with an upbeat, "we're going forward with renewed commitment" send off. A Casino event played as a team building event. We start off the event with a practice session with the dealers teaching everyone how to play the various casino games. We'll break for a meal and hand out packets containing $10,000 to each table who will be designated as a team. Each team will come up with their own strategy to try to win the most money. At a designated time the team with the most money wins! A casino party with a fun corporate team building twist! 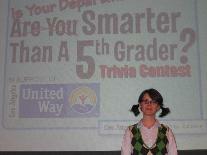 Is Your Department Smarter Than A Fifth Grader? "IS YOUR DEPARTMENT SMARTER THAN A 5TH GRADER?" Similar to the popular T.V. show. This show is played in teams where the competition will be eliminated down to one final winning team. Our Game Show Hosts keep the show organized, comedic, and fast paced, while our improv/comedy actors play the roles of the 5th graders. Company questions and bonus questions are included. We encourage the participants and the viewing audience to interact and vote for their favorite team. Your next bored meeting doesn't have to be. John's ability to morph into a myriad of public figures has prompted US Magazine to salute him as "the new man of 1000 faces". Weave your important messages into humorous presentations by his characters. Imagine David Letterman announcing Top 10 ways you know you're working on another merger. When Larry King interviews your C.E.O., your guests will love it! A fast paced, interactive demonstration of mind reading, magic and psychic abilities. This workshop will focus on how to improve the mind with visulation techniques, the use of intuition, solid team work and enhanced communication skills. Humorous, low pressure, high end entertainment. "A MEETING YOU'LL DIE FOR"
You go to a meeting to hear some now "hot shot" motivational guest speakers, when suddenly it just doesn't seem like any other meeting. Why are we gathered in a spooky wine cellar with spider webs and garlic? And what's with those weird guest speakers? They arrived late arguing over who should park the car. Their bickering makes you want to laugh, but should you? You start to wonder-just who hired these people, when, POW, WHAM, CRASH, somebody dies! What did you see? What does the person sitting next to you have to hide? Any guest is a suspect, including you! Can you clear your name, have a good laugh and help your team solve the mystery? A Teambuilding Event To Die For! Prior to the workshop, we'll work with you to discuss your goals for the seminar. Tell us about your existing teams, current tasks, potential problem areas or sensitive issues. We can incorporate skills into the workshop that will help employees and managers learn tools they can immediately use in their workday. A drum circle is a group of people gathered into a circle for the purpose of making music with percussion instruments. Drum Circles create an uplifting activity where anyone can participate at any musical skill level. The steps involved in successfully playing music together as a corporate group creates powerful synergy and enhanced camaraderie. Teams set out to photograph themselves fulfilling a series of unique "photo challenges" set forth in their team packets. This hunt culminates with the creation of team collages when all teams return from their adventures. Deliver a corporate message to boost company morale and inspire teams. Promote new products, acknowledge top sales managers, focuses on your companies assets and accomplishments. Dial M will build an event for you. 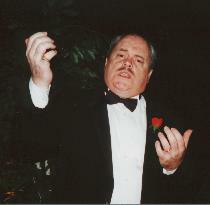 Let our George Bush Impersonator motivate your company with a personalized speech. Game Show Part 1 "The Longest Chain Game Show"
Game Show Part 2 "The Longest Chain Game Show"
Did you know we have another web site devoted to our teambuilding activities? Click this picture to go to www.teambuilding.bz. If you don't see what you're looking for - Just ask! 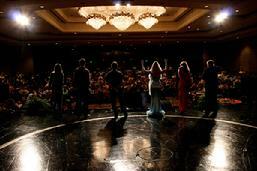 Corporate Workshops "Write Your Own Corporate Songs"
We make your event planning simple!